This fall/winter 2 events has happened at about the same exact time. The fridge big the bullet and we ended up purchasing a new fridge. I have heard that end fed antennas can be a bit noisy. But this noise was terrible. A nice 148′ long wire was erected from the chimney to the tallest tree in the back yard (about 70′) per the recommendations from a reading from VE3EED (SK). The counterpoise is a ground wire/rod about 20′ directly below the antenna connection. From there I tried several different things, threw a counterpoise across the roof, disconnect the ground rod counterpoise, etc. All still tons of noise. 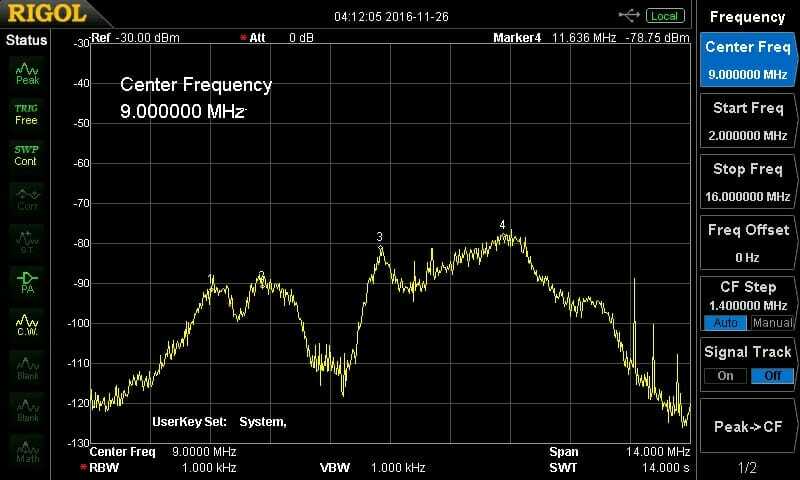 We’re talking S9+10 on the meter here, even covering up strong SWL broadcasts from 2-15MHz! A few other things I tried was going from a 9:1 home made un-un to a 4:1 commericial one. Eventually I ended up going with an off center dipole with the opposite side about 75′ to another tall tree in the front yard. Still noise noise noise! 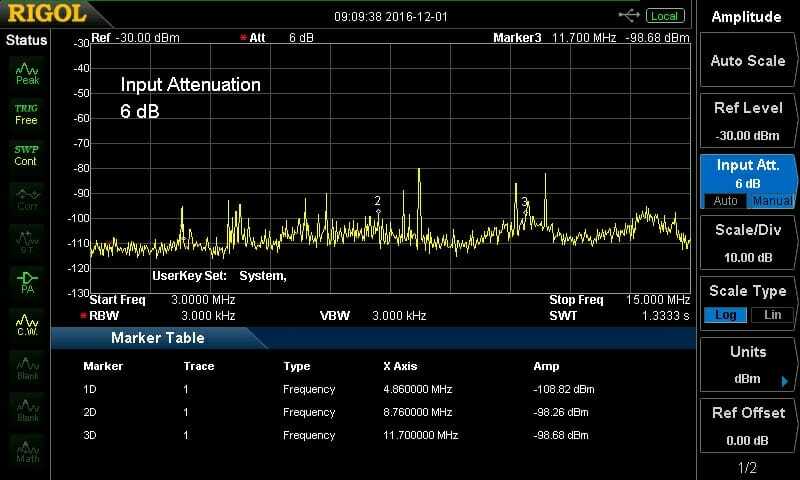 More investigation (turning the house completely off) revealed that not only was the RFI within the house but also the 40M antenna was picking up the noise. 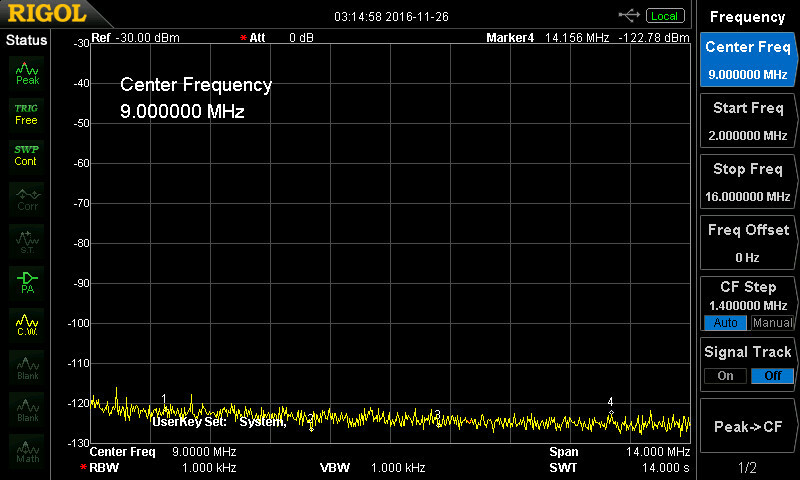 Since the nearest point of that antenna is more than 50′ away the noise was more like an S1 increase on 40M. I estimate the new wire is about 25′ from “ground zero”. 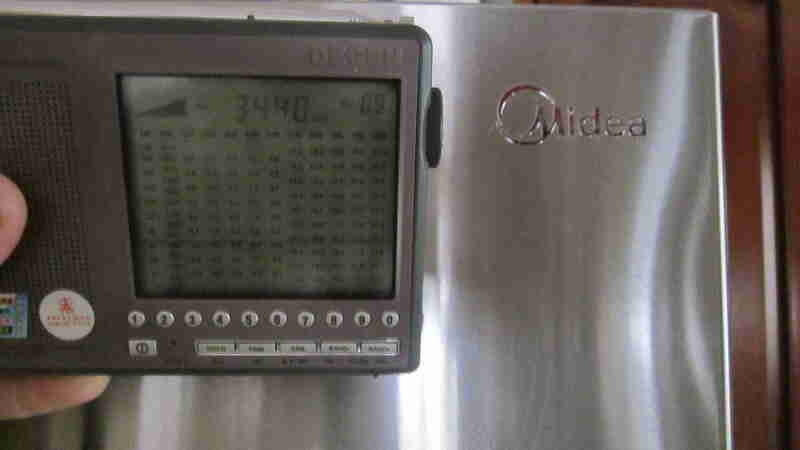 Eventually by tripping breakers one at a time it was traced down to the new Midea HC-767WESS fridge. In addition to the fridge I found a cable TV box spitting out some hash as well as an electronic wall-wart for a cordless phone, but these are minor (fixable) annoyances compared to the fridge. My trusty Degen 1103 hand held SWL receiver does a great job sniffing down RFI. 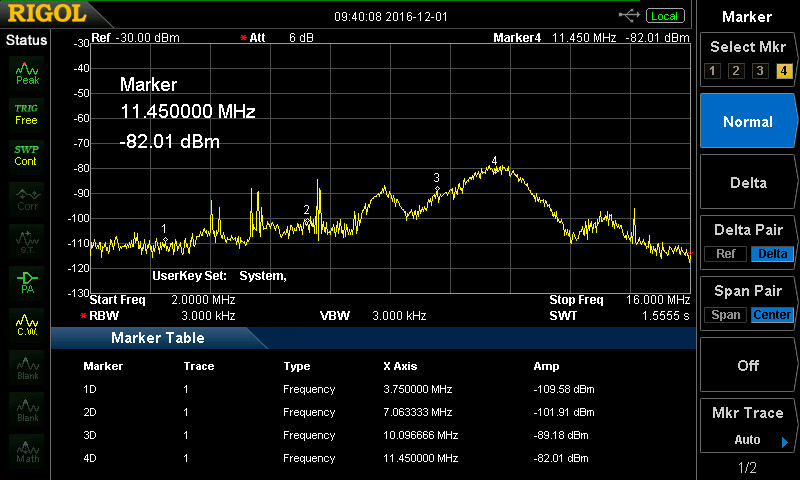 Here are a few snapshots from the spectrum analyzer. 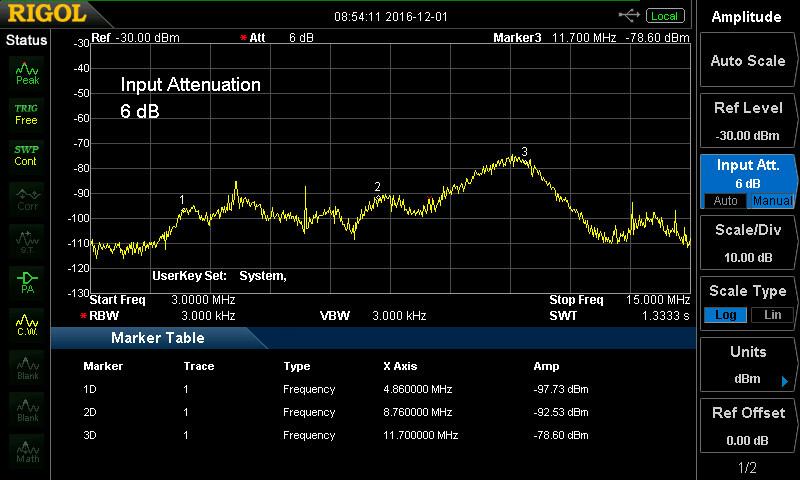 The Analyzer is a Rigol DSA-815 set up to cover 2-16MHz, no attenuator, preamp on, and a RBW of 1KHz. The antenna is a 2M 1/4 wave at approximately 3 feet from the fridge. Signals Received with the 2M antenna and the fridge off. Those large peaks are SWL BC stations! Here is what it looks like when the fridge is running. The Tripp Lite RFI ISOLOK2-0 and snap on ferrites arrived. After hooking the ISOBLOK up to the fridge there was almost no improvement, at least not enough to count. Also added were 4 snap-on ferrites from the fridge on up the AC line. There was NO SIGNIFICANT IMPROVEMENT. Finally I added a wire from the fridge chassis to ground and saw some improvement. It’s not great but enough for the 40M dipole noise to be greatly reduced to S5. Taking the SA back up stairs we made a few snapshots with and without ISOBLOCK, Ferrites, and Ground. 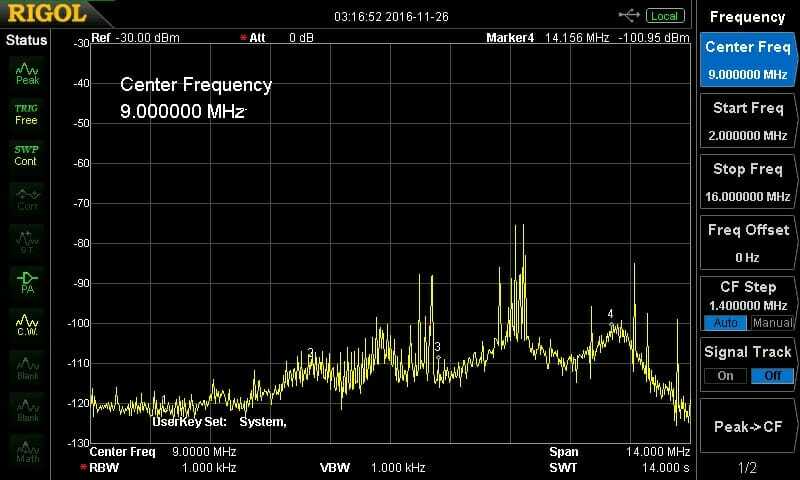 As can seen from the graphs adding the grounding to the chassis gave a nice improvement for 80M operation, 20M & 30M seems tolerable and a slight reduction for 40M but still excessive. 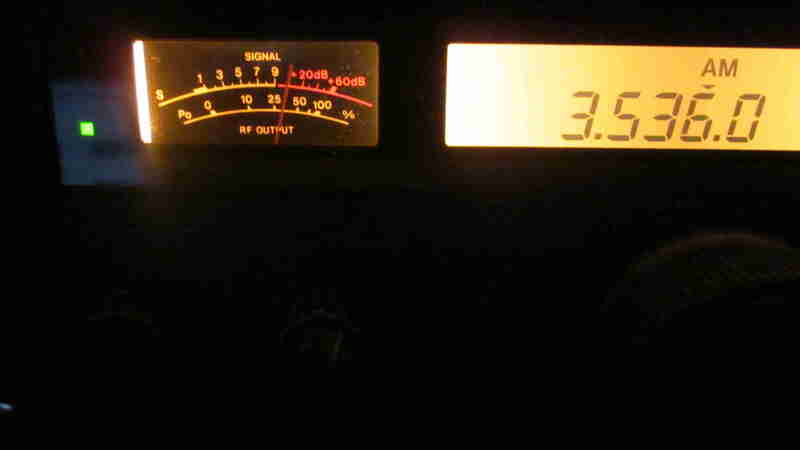 Overall was a 13-19db decrease in noise, mostly from adding grounding to the chassis. I have had 2 requests into Midea with absolutely NO REPLY BACK. 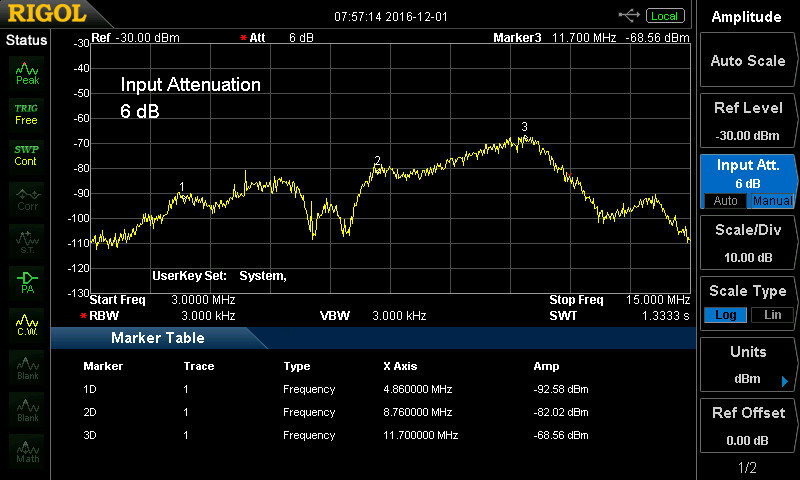 Outside of checking the new antenna I’m am out of options…………..
We can’t check the 80/160M antenna at this time. It’s currently in process of being moved about 30 feet farther from the house. (We won’t go into details of falling off the roof during the move). The antenna is up but the coax is now about 30′ short! Tune in next time…. Same bat time….. Same bat channel…….